With the holidays here, people are searching for gifts—no matter what they celebrate. But let’s face it, finding presents is a hard and time consuming thing, which is why I was pretty happy when I came across Bonjour Jolie. Bonjour Jolie offers either a one-time or monthly subscription of boxes specialized for your period. When you subscribe at Bonjourjolie.com you can choose the type of box you want and then customize it. You can add or subtract things from your box, pick your favorite hygiene products, tell them around when your cycle starts and you receive a special box full of goodies when your period starts. My favorite thing about Bonjour Jolie is how inclusive they are. You can get snacks that work with whatever diet you have—from vegan to organic to kosher to halal—which allows for so many different people to reap all of the benefits of the box. There are also special boxes for transmen who still get their periods, as well as non-binary people who get their periods. These boxes include men’s hygiene products if that is what the person ordering prefers, and they can still get everything that comes in the basic box. 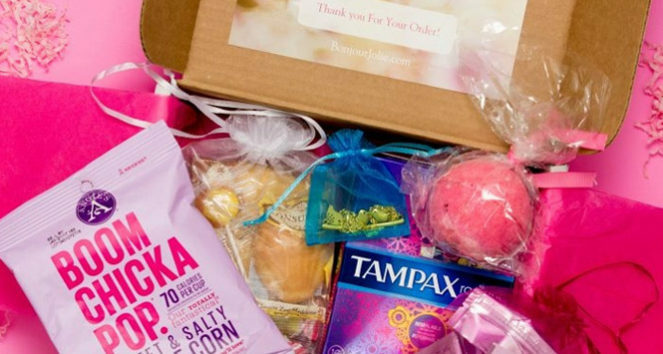 Another special box is made for people who are new to getting periods. The box is full of everything a person needs to get through their first period from pads to chocolate and everything in between. So, if you’re looking for presents this holiday season, I highly recommend buying a loved one a Bonjour Jolie box. It’s practical, cute and overall just a thoughtful gift. You can order at Bonjourjolie.com.